The Minnesota Vikings have had a front row seat for one of the most impressive quarterbacking dynasties in recent memory. At the same time, they’ve struggled to find a quarterback capable of producing sustained success. But as the rival Green Bay Packers close in on three decades of Brett Favre and successor Aaron Rodgers, the Vikings might have finally found their guy. 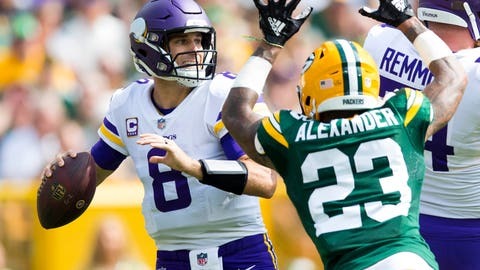 Newcomer Kirk Cousins looked the part Sunday at Lambeau Field, throwing for 425 yards and four touchdowns while thoroughly outplaying Rodgers, hobbled as he was by a bum knee and the Vikings’ ferocious defense. It was just the fourth time a quarterback has thrown for 400-plus yards and four-plus touchdowns in a game against the Packers. Outside of two(ish) seasons of their own from Favre, the Vikings haven’t had a quarterback produce such numbers since the early ’00s. Cousins is the first Vikings quarterback to throw for 400-plus yards in a game since Favre in 2010, a list that’s still just 13 games deep, but features a few Minnesota greats. Cousins is the first Vikings quarterback to throw for 400-plus yards and four-plus touchdowns in the same game since Daunte Culpepper in 2004, and the seventh overall. After Culpepper you have to go all the way back to Randall Cunningham in 1998 to find such a game, then Tommy Kramer in 1986. This shouldn’t be particularly surprising. Cousins has been here before. Cousins has topped 400 passing yards four times in his career: Against the Packers last week, the Dallas Cowboys in Week 12 of 2016, the Cincinnati Bengals in Week 8 of 2016 and the Philadelphia Eagles in Week 3 of 2014. However, that hasn’t resulted in any wins thus far: The Packers and Vikings were both victimized by missed field-goal attempts, the Cowboys held off a Washington comeback to deal Cousins a loss, the Bengals connected on a late field goal to force a tie and the Eagles won thanks to some late heroics from Nick Foles. This is, however, unfamiliar territory for the current Vikings. For all of predecessor Case Keenum’s success last season, he wasn’t one to post gaudy numbers reliably. Keenum threw for 300-plus yards twice last season, starting with a Week 3 romp against the Tampa Bay Buccaneers. Sam Bradford did it twice in 2016 — his lone season as the Vikings’ starter — despite setting a single-season record completion percentage (71.5 percent). Teddy Bridgewater went for 300-plus yards three times as a rookie, then just twice in 2015, his most successful year as the Vikings’ starter.